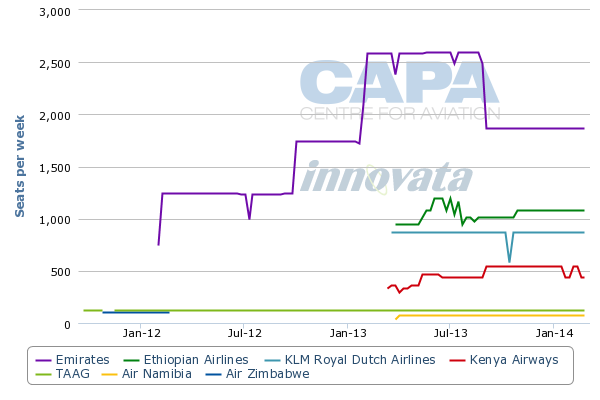 SAA dominates the Johannesburg-Harare route with 29 weekly frequencies in the week from 09-Sep-2013 to 15-Sep-2013 according to Innovata, using a wide variety of aircraft types offering a total of 3,414 seats giving the carrier a 63.5% capacity share. British Airways flies daily on the route with 737-300 and 737-400 aircraft offering 916 one-way seats per week. In the absence a national carrier, Zimbabwe’s regional links have been served by a number of African carriers including Air Botswana, Air Namibia, Ethiopian Airlines, Kenya Airways, Mozambique Airlines, SAA, TAAG and British Airways under franchise to Comair. The government has refused to grant licences to domestic carriers to compete on profitable domestic routes between Harare, Bulawayo and Victoria Falls, as well as regional services to South Africa in favour of protecting the heavily indebted national carrier - at the expense of the economy, the ZNCC states in its report. This sort of wishful, ambiguous thinking pervades many governments' analyses of airline activity. The variables usually not fully accounted are such things as the actual cost of providing a national airline service (especially where, as here, massive subsidies are required to keep the flag carrier in the air) and the potential for partnerships - or even contract operations - with other airlines. Time and again, ambitious national flag carrier plans have resulted in massive losses to the treasury. For small economies like Zimbabwe's, absorbing the levels of financial risk associated with owning an airline are completely disproportionate to national priorities, where the probable - and almost invariable - outcome is more subsidy.